We cook dinner almost every weeknight. Sometimes it's quite simple, like grilled chicken breasts and baked sweet potatoes, and sometimes it's a little more ambitious, but whatever the meal, we aim for protein and vegetables, sometimes with brown rice or quinoa, and as little processed, prepared food as possible. I say as little as possible, because it simply isn't always possible. We buy dry pasta, graham crackers, Panko breadcrumbs, etc... I can't fathom trying to make everything from scratch - just the thought of it is exhausting. We simply aim for a good balance, with the majority of what we eat being whole, fresh foods. 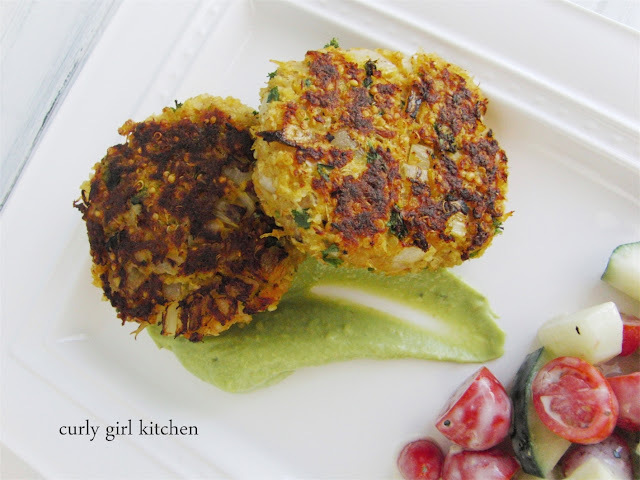 On the weeks that it's my turn, it can be challenging to come up with tasty dinners that can be prepared in under an hour, that also aren't too repetitive of the same foods and dishes over and over. Chicken and sweet potatoes, sirloin and broccoli, shrimp and salad, salmon and quinoa... you get the idea. 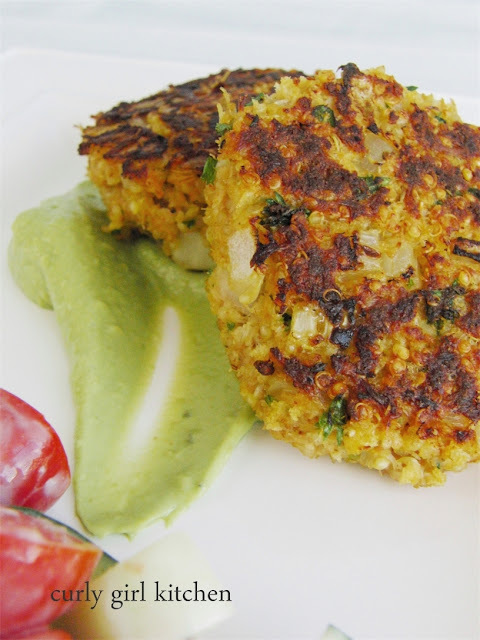 With an idea for crab quinoa cakes, but without any real plan for how I would make them, I jotted a few ingredients down on the list and decided to wing it. Which can sometimes go very badly (and has, many many times), but impulsive cooking can also result in some pretty yummy foods, too. I started by cooking the quinoa in water - although it could also be cooked in broth - and then I made a savory mixture of lump crab meat, the cooked quinoa, diced jalapenos and onions for crunch and spice, and fresh herbs and spices for lots of flavor. A couple eggs and a small amount of breadcrumbs brought the mixture together so I could shape it into cakes, which I cooked in a little olive oil in a cast-iron skillet. 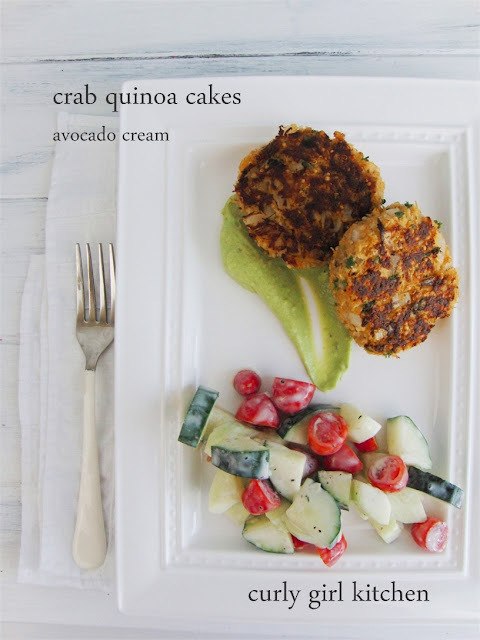 The crab cakes were crisp and golden brown on top and bottom, with a creamy, moist crab filling, and the avocado cream on the side complemented the cakes nicely, although you could use tartar sauce, too. A simple cucumber and tomato salad with a light yogurt dressing completed our dinner. Not too shabby for an impulsively thrown together dish! Note: I had intended to make these without any breadcrumbs, but found that I did need a little to help bind the mixture together to shape it into cakes. Cook the quinoa according to the instructions on the box. Meanwhile, in a bowl, combine the crab, jalapeno, onion, parsley/cilantro, garlic, eggs, white wine vinegar, mustard, salt, pepper, Old Bay and smoked paprika. Stir in the hot, cooked quinoa. Add the Panko, just enough to be able to form the mixture into cakes. Resist the urge to add more Panko than called for - the cakes will be very moist and delicate, but you don't want to add more breadcrumbs, which will just dry out the cakes. Heat a large cast iron skillet or heavy-bottomed skillet over medium heat until very hot. While the pan is heating, shape the crab mixture into 12 cakes and set on a baking sheet. Pour 2 tablespoons olive oil into the hot skillet. Handling the cakes carefully, place 6 cakes in the hot skillet. Cook for about 5 minutes, until they have a golden brown crust on bottom. Turn the cakes over, being careful not to break them apart (I used two spatulas, using one to gently flip each cake over onto the other spatula, and not a single one broke), and cook for another 5 minutes. Transfer to a clean baking sheet and keep warm in a 200-degree oven while you cook the remaining cakes, adding more oil as needed. The cakes will have a crisp crust on top and bottom, with a creamy moist texture inside. For the avocado cream, blend all ingredients together in a food processor and serve with the crab cakes. 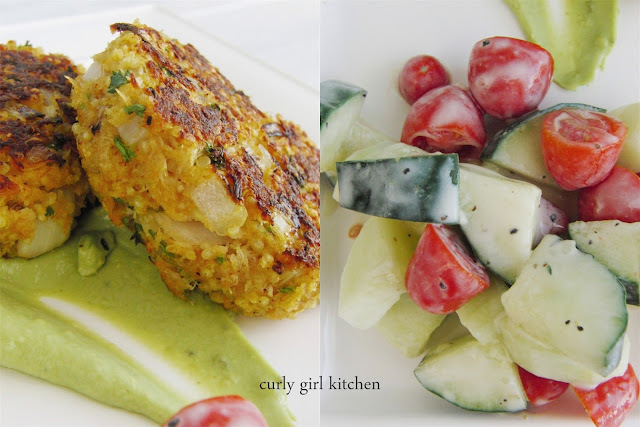 We ate our cakes with a simple cucumber tomato salad, dressed with a light yogurt dressing of 2 heaping tablespoons Greek yogurt, 1 tablespoon white wine vinegar, 1 teaspoon Dijon mustard, and salt and pepper.